This doesn't have much to do with camping or trekking but some people here may be interested in seeing some photos of a fairly common arctic winter weather condition. Working in the arctic, I often experience winter whiteout conditions which can have serious consequences if you’re not prepared to deal with them. I’ve developed a strategy that I feel will help keep me safe in a whiteout. I don’t claim to be an expert but this is what works for me. Whiteout is much the same as “flat light” and is usually caused by low thick cloud accompanied by snowfall which prevents sunlight from penetrating to create shadows and definition to the snow. Winds can vary from calm to blustery. Arctic whiteouts differ from those further south in that there are often no rocks, trees or other objects around to provide reference. I describe it to people as going down into the darkest mine shaft with no light at all. Now all you do is change the colour from black to white. The sensation is the same. Although you can see objects close to you, there is no reference for horizon, up or down or topography. 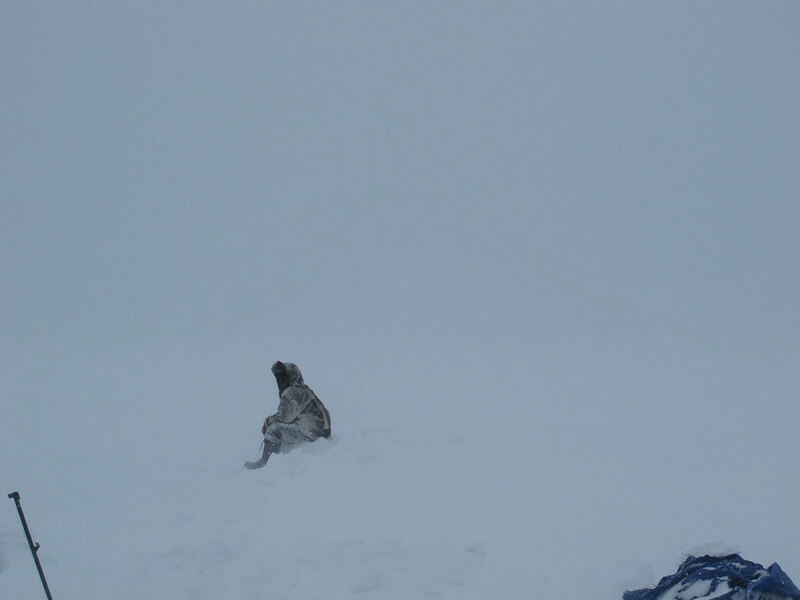 Here’s Levi, a wildlife monitor, watching for polar bears outside a camp on Baffin Island. A challenging task on that day! I teased him that he was baiting the bears with his sealskins. 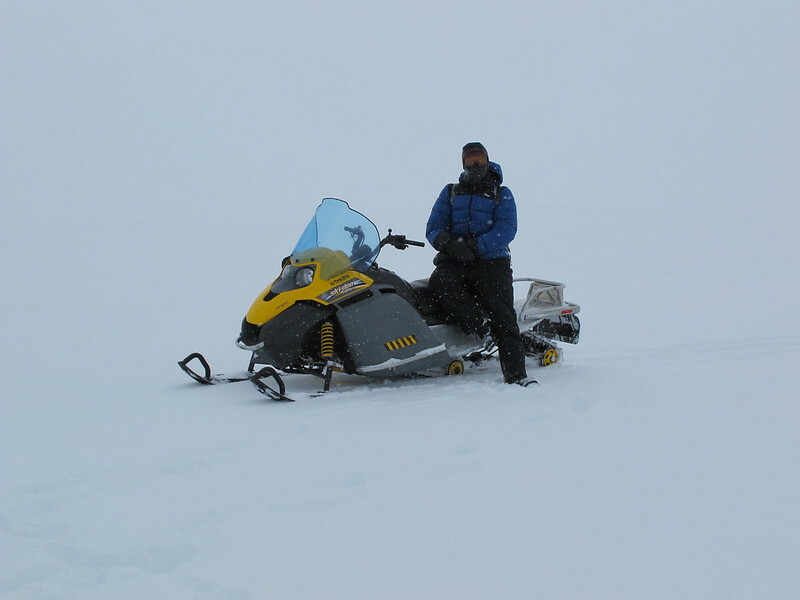 I went out to do a snowmobile magnetic survey near Cumberland Sound in a whiteout one day. The survey grid was 10 kilometres from camp and I had to use GPS and a mental map of the topography in the area to navigate there and back. I knew that there were only 2 deep gullies that I had to avoid on the route and since I knew their distance from camp and that they were on hillsides, I was able to steer clear of them by monitoring my distance on the GPS and by staying in the bottom of valleys by steering downhill every time I felt myself on a sideslope. I probably shouldn’t have been out that day but felt comfortable with the level of risk involved. I brought along a fellow technician to follow behind in case I ran into any problems. 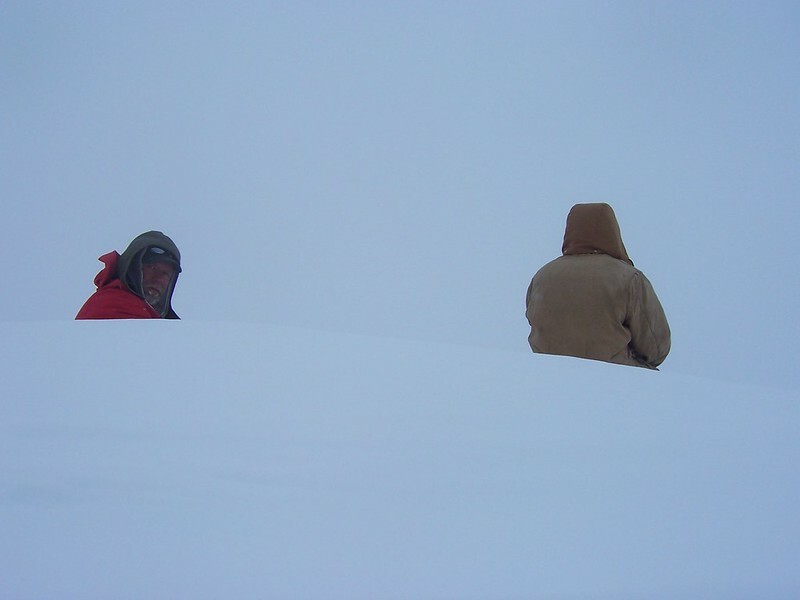 Here’s a photo of Gary and I waiting for a helicopter pickup near Repulse Bay, Nunavut after a day of surveying. We had to wait several hours for the sun to poke through enough to provide reference for the pilot to be able to come get us. 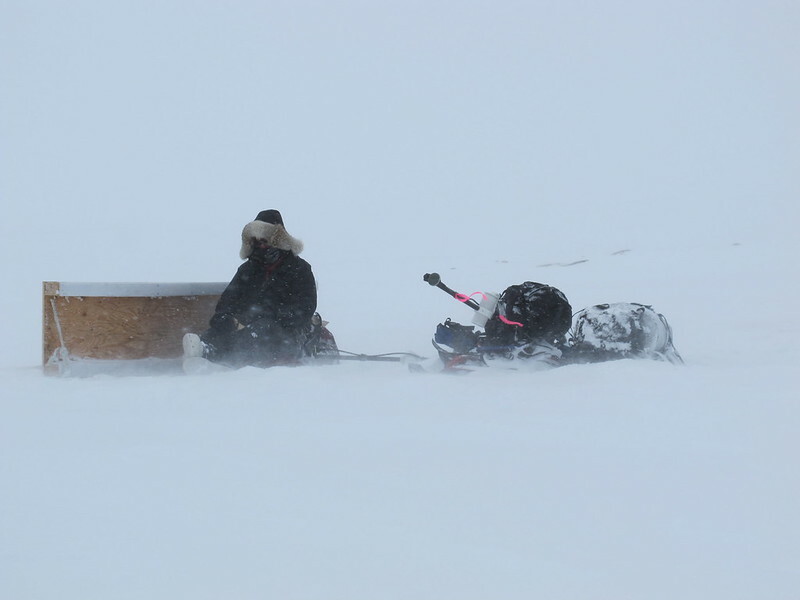 Geophysicist Shawn and I were doing a snowmobile/ dogsled mag survey near Wager Bay, Nunavut when a blizzard came in. We were 38 kilometres from camp and didn’t expect the helicopter to be able to pick us up, but we had an excellent and very experienced pilot and he managed to get us safely back to camp. Here’s a poor quality youtube video of part of the flight back to camp. We were flying about 20 feet above the ground and the pilot is constantly scanning for rocks to reference where the ground is. I can’t count how many heli flights like this I’ve had. We often have to set down till the visibility improves enough to see the next rocks so we can continue. We pass a herd of caribou at the 0:50 second mark. Helicopters and iglus don’t mix! 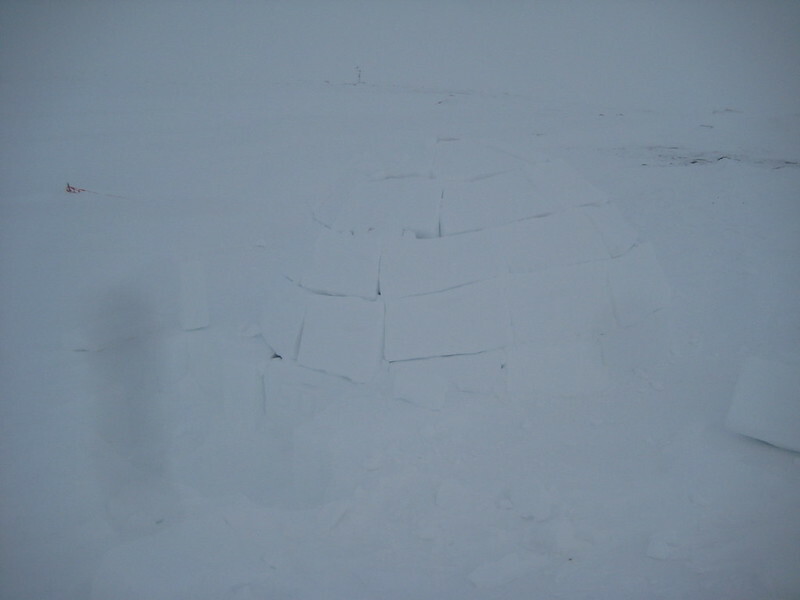 I was acting as a wildlife monitor at a diamond drill site situated on a lake and to kill time I built an iglu. Several days later we had a big blow and whiteout conditions. I went out with the helicopter to do a crew change. 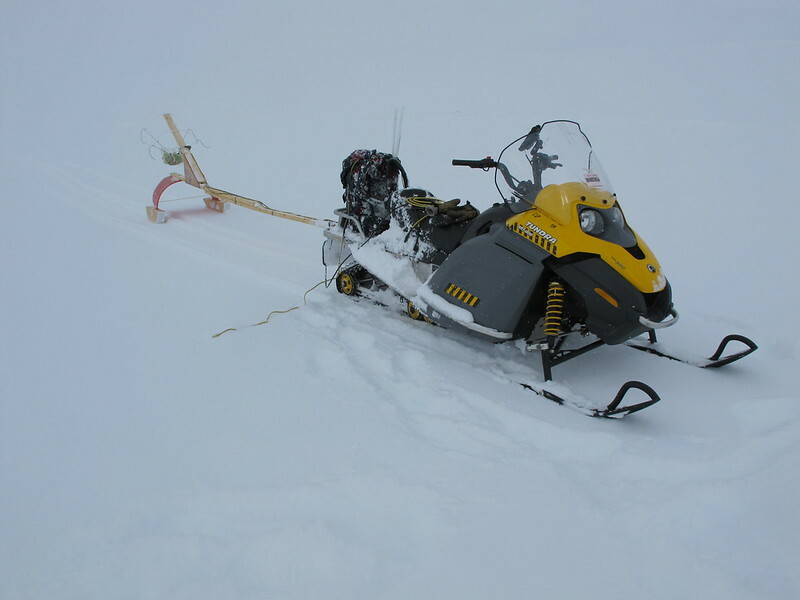 Although visibility was near zero we spotted the drill out on the lake and using the mast of the drill for vertical reference the pilot eased the helicopter down to the surface through the swirling blizzard of snow. As we touched down the pilot and I both noticed something strange through the lower front bubble. The snow looked different and wasn’t blowing. I stepped out of the machine and walked to the front and found that the nose was buried in the iglu I had built. The iglu was impossible to see in the blowing snow and I had to feel around before I finally realized that it was in fact the iglu. 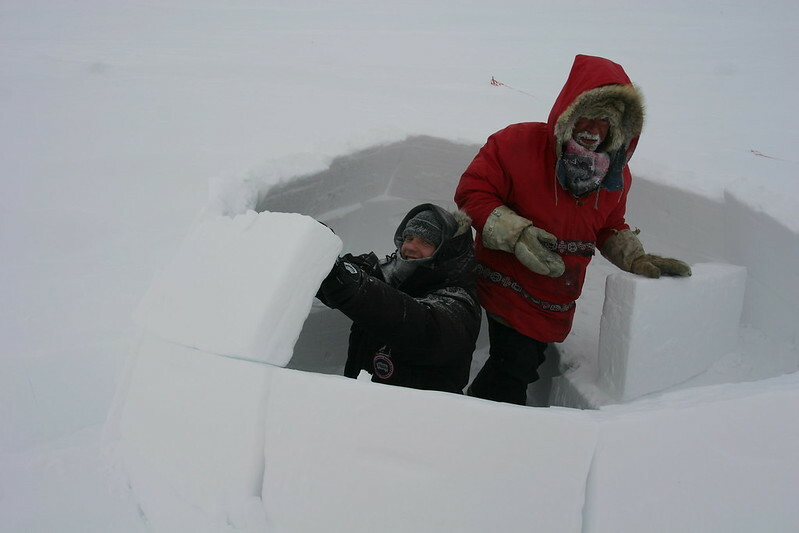 We were extremely fortunate that we didn’t touch the iglu with a skid or the tail rotor and I swore then that I would never build an iglu again anywhere near where a helicopter or snowmobile could run into it in whiteout conditions. Kind of cool how plastic the snow becomes though. There weren’t any holes in the iglu wall. As I mentioned, I have a strategy that makes me feel confident in whiteout conditions. The first is to have the equipment necessary to navigate, as well as having “clue awareness”. For navigation I always have my compass (set to local declination) and a map, or at least some kind of sketch of the area. I also have at least 3 GPS units and a lot of extra batteries. I use Garmin products and I prefer the older units like the MAP76 because they’re a little simpler. The antenna isn’t as good but in the arctic you’re not dealing with tree cover so it hasn’t been an issue for me. The only time I’ve ever had a GPS unit fail was with a model 62. The software was doing all kinds of crazy stuff so I just feel more confident with the simpler older units. I always have the track feature turned on so that I can follow my track back to camp if I lose visual reference. I generally won’t head out in a whiteout, but that being said, I’ve gone out on many trips to pick up field crews that got stuck on the tundra after the weather turned sour and the helicopter couldn’t pick them up due to whiteout conditions. In these situations I always have coordinates for the crews so that I know where to pick them up. I also carry a SPOT, or other messaging device as well as a satellite phone and I make scheduled call-ins back to camp - generally every half hour. One important thing to have is a good pair of ski goggles. I once got caught 12 kilometres from camp in a blizzard that came on extremely fast. It was like someone flicked a switch from calm and partly cloudy to full on howling blizzard. I only had a pair of sunglasses with me and they were totally inadequate. 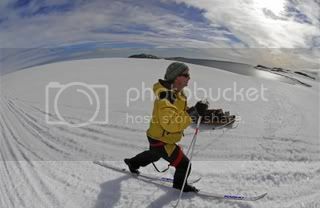 The snow was packing up behind the lenses so that I couldn’t see to follow the track line on the GPS unit, but if I took the sunglasses off I couldn’t open my eyes because the snow was blowing so hard. It was a miserable couple of hours making my way back to camp but I knew I was there when I drove the skidoo into the side of the white kitchen tent. Clue awareness is just making sure you use all of the environmental clues that are around you. 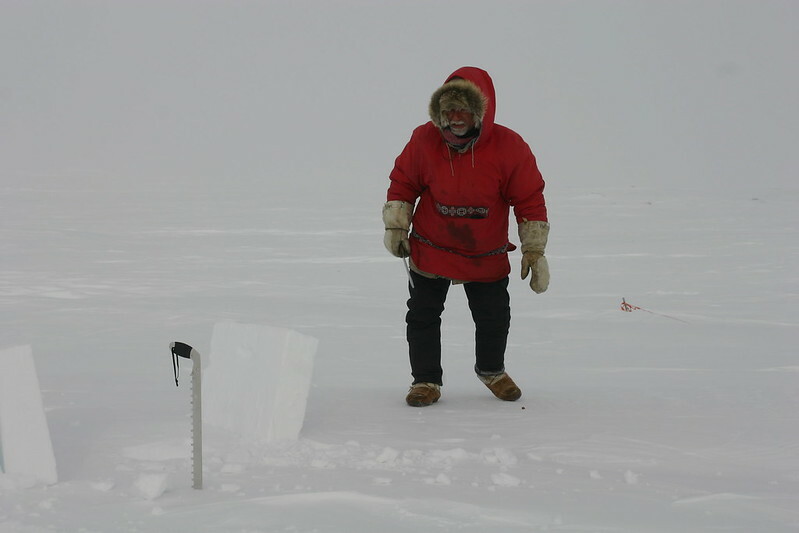 These include things like wind direction, direction of snowdrifts that you’re crossing, checking to see if there’s ice under the snow, looking for rocky areas which usually indicate that you’re on higher ground, and slope of the ground. If you’re trying to follow a valley bottom you can usually feel when you’re climbing on a side slope with a skidoo so you can steer back to the bottom. Going straight up or down a hill is more difficult to discern. Many times I’ve been cruising along at low rpm and noticed that I haven’t felt any bumps for a while. I’ll put my foot down on the snow and find that I’ve been climbing a steep hill and slowly came to a stop when the engine speed wasn’t enough to keep me moving. On the other hand I’ve released the throttle and stepped off the machine, thinking that I was stopped, and watched the snow machine carry on down a steep hill as I tumbled after it. The next part of my strategy is to have the means to make a shelter. 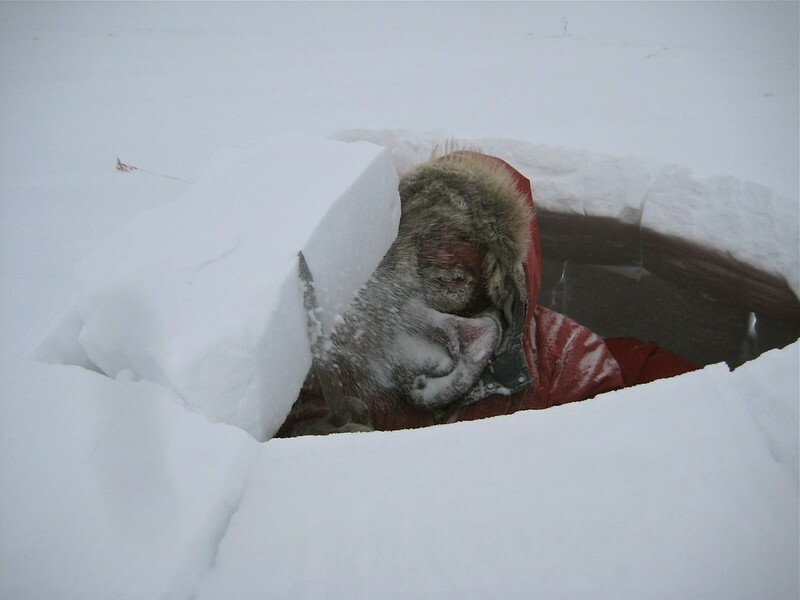 For me in the arctic that means having a snow saw and large knife for shaping snow blocks to make an iglu. One of my first arctic jobs was at Repulse Bay. Another fellow and I were doing surveys and traveling to our grids by helicopter. The contractor we were working for had sent a cheap Canadian Tire tent along for us to use in a survival situation and I had absolutely no confidence that it would be adequate to survive an arctic blizzard. We had weekly safety meetings in camp and every week I asked that someone from the community teach us how to build an iglu. It finally happened during the last week I was on the job, but better late than never, and I’ve used the skill ever since. I know that if it’s ever really necessary to build an iglu for survival, the weather conditions will likely be bad so whenever I have to stay in camp due to a storm I take advantage of the opportunity to practice my iglu building somewhere just outside of camp. I’ve done this in conditions so bad that I can’t see the blocks I’ve cut even when they’re only a few feet away from me. 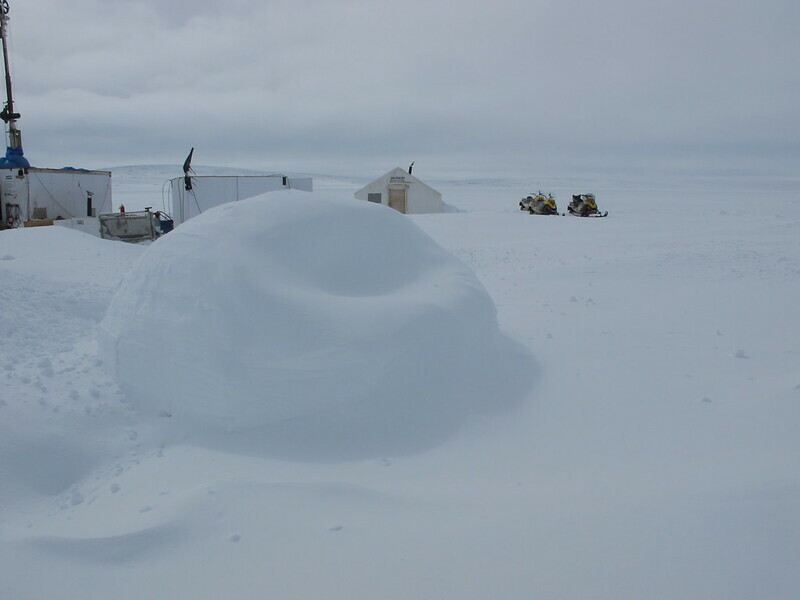 Here are a few photos from a camp south of Lac de Gras, NWT when I helped Shawn build his first iglu in a winter storm. Here’s me with my snow saw and knife after cutting the first few blocks. I cut blocks and gave Shawn tips on construction. As we got near the top, Shawn started having problems setting the blocks so I finished the last round. Here’s the finished iglu with just the cracks left to be chinked. You can imagine how hard it will be to see once the cracks are filled. Very cozy and nice and quiet inside though. I certainly don’t enjoy getting caught in whiteout conditions, so I watch the forecasts (as good as they are in the arctic) and closely monitor weather conditions while out in the field. At any sign that weather is deteriorating I call the helicopter for extraction or head back by snowmobile, but sometimes the weather changes too quickly, or the helicopter is unavailable. In those cases it pays to have the equipment and the practice in using it to be able to comfortably stay out overnight, or for several nights. Who would have known that an iglu would be a threat to low flying aircraft. I have been on Scottish mountain in similar conditions, having a 2000ft drop close by really concentrates your thoughts. One tip was to throw snowballs in front though you have to be really worried by the time you resort to that! Wind direction was always a clue but that must be harder when traveling on a snowmobile compared to walking. I was looking at a 3D laser scanner a couple of days back, same technology that is used on high end autonomous vehicles, I wonder how they would work in those conditions mounted on the front of a helicopter or even a snowmobile. Back in the UK we used an ultra high resolution real-time sonar system that had such high definition that oil rig divers were using it to "see" in zero visibility when working on the rigs. I've used the snowball technique often, especially when, as you say, there is a known dropoff in the area. I've stepped off a 20 foot drop while doing a magnetic survey and got a good thump on the head. The instrument records a track with gps and it was interesting to see where I wandered around aimlessly for about 20 minutes till I started to come to my senses. I really like the idea of the laser scanner to "spot" obstacles. Keep the various reports/experiences coming ...regardless it can keep the rest of us very humbled in the true risks/realities of what can happen....ie crossing a lake and bam/surprise.. Thanks again, arcticmag. Really interesting to read your words and gain from your experience. Two of us bailed on an NE to SW snowmobile trip across Traverse Bay on L. Winnipeg 5 yrs back when the blowing snow pushed the mid-day visibility down to between one and ten meters - 70 km wind, falling and drifting snow, -28C on the thermometer - crummy conditions. After heading on our compass bearing for 500 m we turned and followed a back bearing (couldn't see our 5 minute-old tracks!) back to our campsite in the shelter of the bush and discussed the situation - including the pressure of having to be back for work the next morning. We decided to sneak south along the shoreline and head in to Little Black River First Nations, then hitch a ride around the bay to get our truck from Victoria Beach. Very helpful people allowed us to be back in Winnipeg with smiles on our faces by 2:00 am. I have always wondered if we could have made the 12 km crossing to Elk Island, but then again, I am glad to have many future opportunities to try. What a great read. 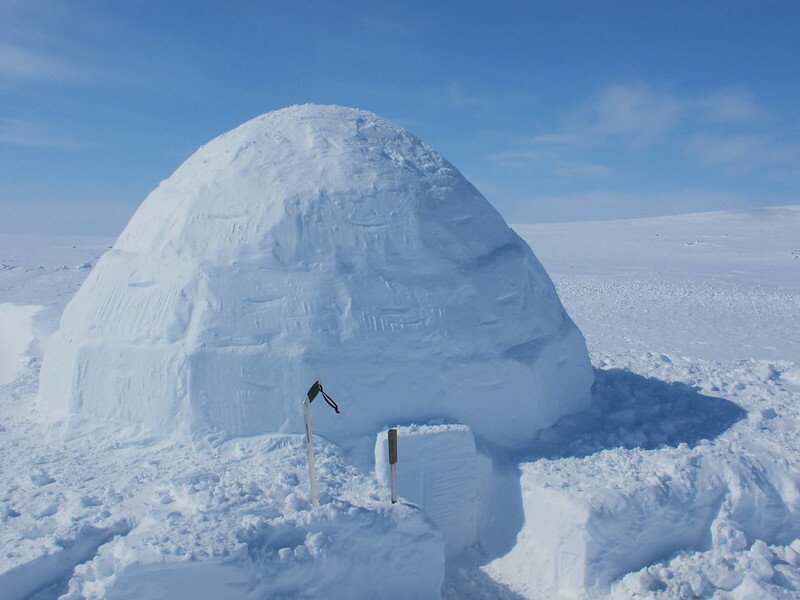 Always want to get up there and do a snowmobile trip sleeping in Igloos. The price is too much for me. I travel a large lake while fishing. Compass and GPS are a must for me. Been caught in several white outs and some heavy fog. Always made it back with the GPS as I have some large pressure cracks to cross which change hour to hour. I have had 4 Garmin GPS fail. Your GPS is only as good as the map and compass you carry with it. Wow, city boy me loved that post. Just amazing to hear these stories, I would like the opportunity one night to sleep in an igloo, that's a wish list. The watching for bears part is scary. Be safe. Your description and photos of whiteout are bang on. It is indeed a scary experience to be travelling on land or in the air in such conditions. I remember one exception, however, when a whiteout was not so unpleasant. I used to live on Baffin and one March we were travelling across the giant Amadjuaq Lake from S to N by snowmobile. The light was totally flat, absolutely no definition on the surface, no distinction between the lake ice surface and the sky. On land this would be dangerous because you could crash into a gully or hit something, but there were no obstacles on the lake, no pressure ridges, nothing. Under those conditions, all I could do was relax my body and try to absorb the forces from the drifted lake surface. Fortunately the drifts were large, so if you didn't try to go too fast, it was rather like travelling on a rolling sea. It was almost like I wasn't driving at all: just a passenger on a journey through the clouds. When portable gps units came out, I got one and made a mount on the dash of my Enticer II, where the warm engine air comes out through a grill behind the windshield. I also connected the power supply to the start battery. That way I could see the gps all the time and just follow the arrow (no map display back then). Made travel under such conditions at least possible if not safe. Unfortunately I didn't take many photos in those days, or if I they are lost. Nice to see yours, thanks for posting. Hey Kinguq, I love the rolling sea description. Since you can't see anything anyway, I sometimes just close my eyes and enjoy the dream. Thanks for sharing these fantastic photos! The arctic and the conditions therein (weather, isolation, remoteness, topography, flora & fauna, etc.) is all very fascinating to me. 1) We'll build a quinzee, which, while different in construction techniques, will give you almost the same effect of sleeping or habitating in. 2) I'll enable you to stay awake all night outside the quinzee or tent one night on bear watch. I'll even give you a pop gun to make your experience more realistic. If you listen carefully, you might just hear some god-awful noises coming from the tent during the early hours that would give you pause...'"is it a bear?, a cement mixer?, a locomotive?, a dying gut shot moose?..." Just the unspeakable fright of the ruckus would keep you properly awake and alert as you fulfilled your guard duty. Please, don't thank me just yet.